I mean some treat making! Sure baking cookies is great, but what about filling your home with the smell of melted chocolate??!!? I have heard these called a zillion things but pretzel-button- melty-things is usually what i call them. Because i said so. They’re super simple to make. 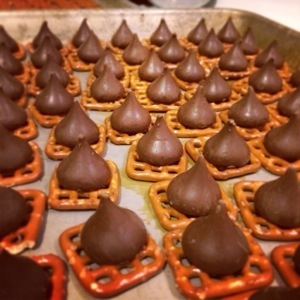 Heat oven to 175, lay out your pretzels then kisses on top. Pop into the oven for 3ish minutes until the chocolate gets shiny. Then push an m&m into the kiss to set it before chilling in the fridge. Try with reg m&ms or a fun flavor, or a fall version with reeses pieces!